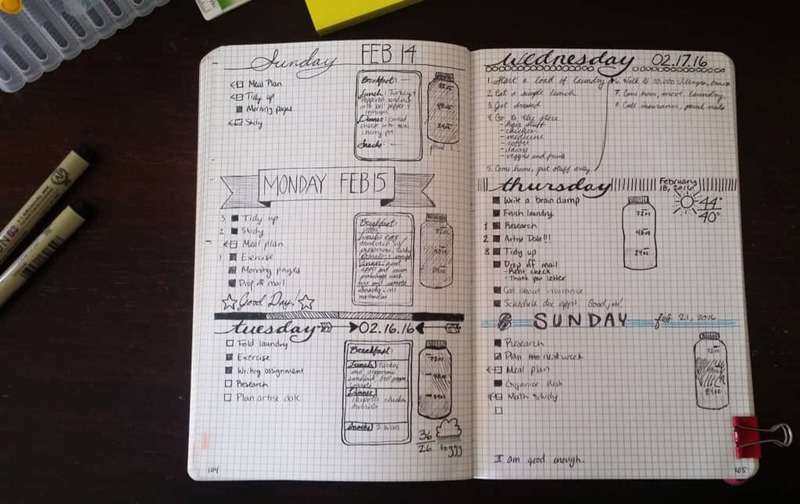 The heart of the bullet journal is the daily entry. In your daily spreads, you write down all the little tasks that you need to accomplish, all your appointments, events, notes, and ideas. The engine of the bullet journal is fueled by the work done in the dailies. 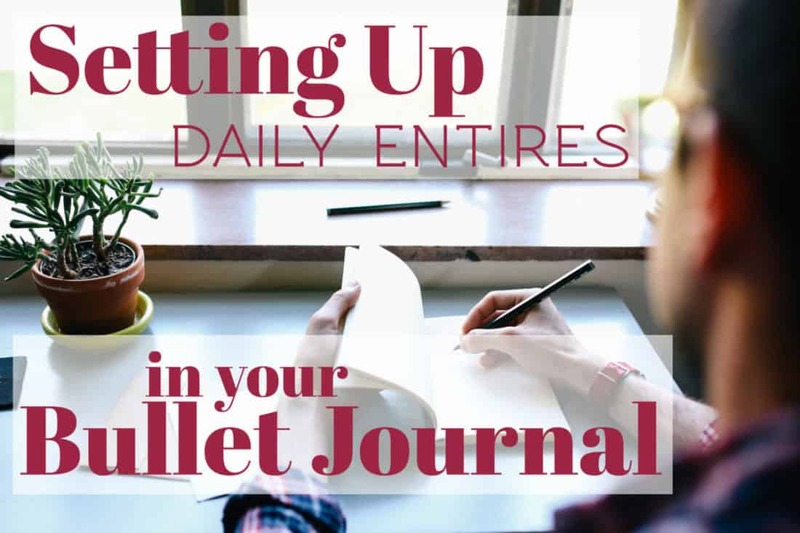 To learn how to set up your dailies the original way, I suggest you visit How to Start Your Very Own Bullet Journal. But today, I am offering a few alternative ways to set up your daily pages by humbly showing you my growth from my very first daily page almost two years ago. You can witness my journey from the traditional, bare bones method to where I am now. 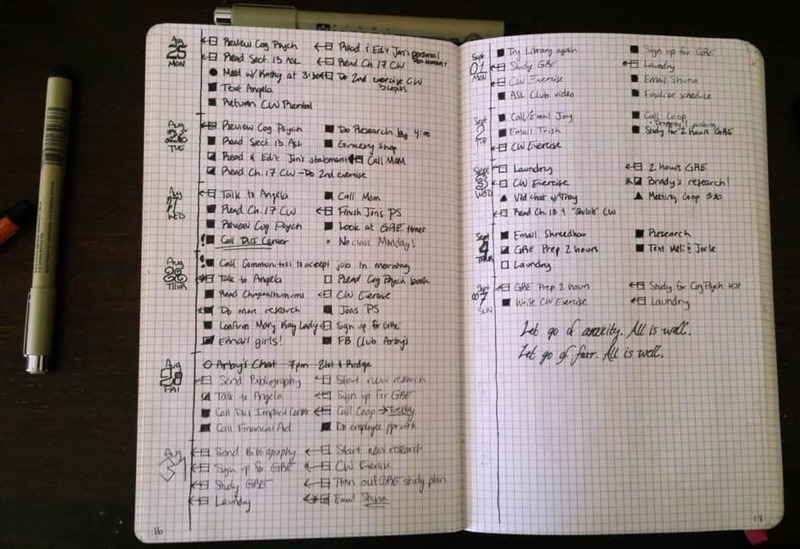 In the beginning, I did exactly what Ryder Carroll suggested when he introduced the bullet journal to the world. I did black ink, square bullets, simple dates, and simple migrations in my graph papered Ecosystem Journal. 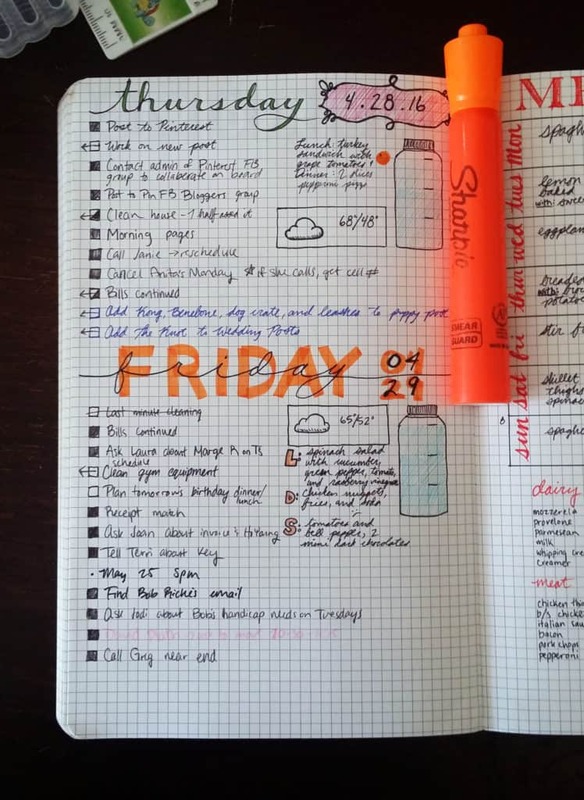 The essentials of a daily spread include: the date and all tasks or appointments for the day. 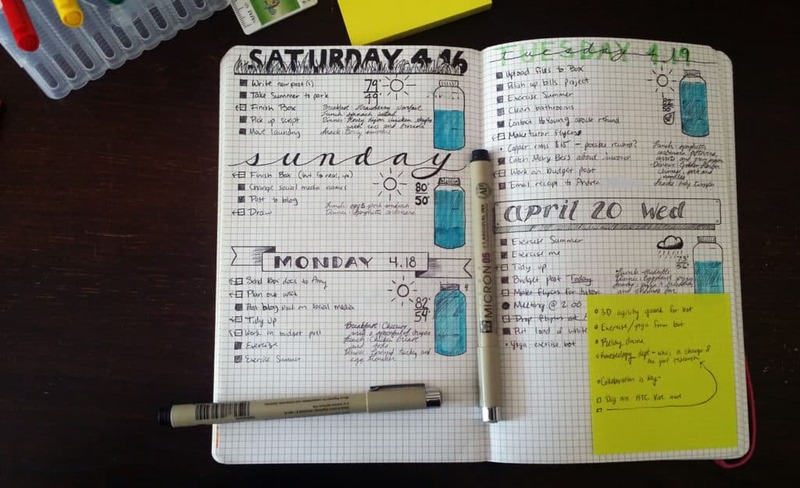 You can add notes or ideas throughout the day, which is easy when you have a journal with you most of the time. No more forgotten ideas! I crammed some six or seven days onto a single page back then. That’s so crazy to me now! I think I used to feel like I needed to conserve my paper for some strange reason, so I tried to be as brief as possible with my tasks and notes. After much growth and experience, I say you should use as much paper as you need or want. If you have a busy day ahead of you, don’t feel shy about eating up most of a page to get down all the information you need. As you can see, I also had much more rough handwriting back then. I have naturally improved my handwriting over the years from sheer use. One of the rather nice things about keeping a bullet journal is that you will probably be writing more than you used to, so you get tons of handwriting practice without even trying. It also helps to switch from crappy ballpoint pens to smoother pens, like the Uniball Vision Rollerball pens. Another thing you will probably notice is the large gaps in between my dailies. 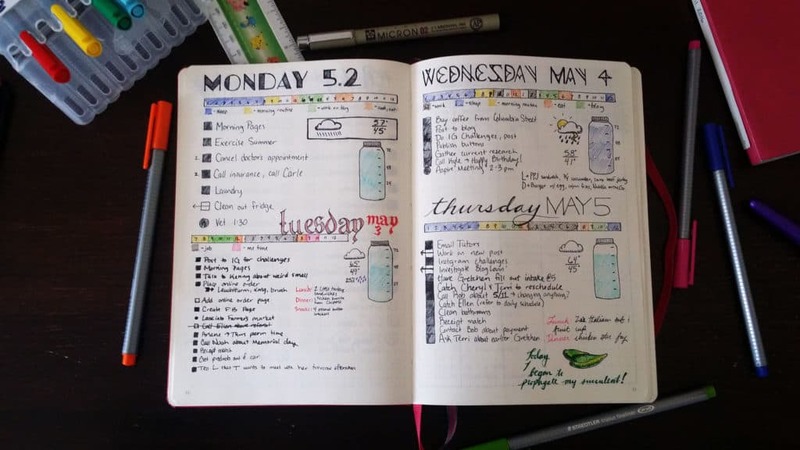 I would often go four, five, or six days without so much as touching my bullet journal. This resulted in many things falling through the cracks, so it hindered my effectiveness with the bullet journal. Over time, I found ways to create a habit out of the journal, but that came with heavy experimentation and time. If you are struggling to stick to a routine, don’t worry. Just keep trying new things until something clicks and you will find yourself coming back day after day with no issue. It came to me eventually, so I’m sure you will find what works for you! You can see that I started experimenting with different decorative dates, the occasional pop of color, or silly fonts. I used some pens I already had, like my Microns or my Prismacolor markers. I was still shy about using too much paper or buying anything new for my bullet journal. It felt like an indulgence that I couldn’t afford. Then I decided to try writing out the date as a header, rather than in the left column. This led me to start playing a bit with banners and scrolls. I think you can see exactly when I got my Pilot Varsity set for the first time. I wanted to splurge just a little, so the Varsity fountain pens felt fun without costing an arm and a leg. For my headers, I opted for a pop of color with a plain, simple font. This is still one of my favorite pages to flip to in my old bullet journal because I love the consistency and boldness. I would suggest this method for those of you who prefer the minimalist style but still want a little dash of decor. It takes no more time than writing out your header with a black pen, so no time is wasted creating this fun look. I continued on like this for many moons, and it was a happy time. It was simple and I got things done. 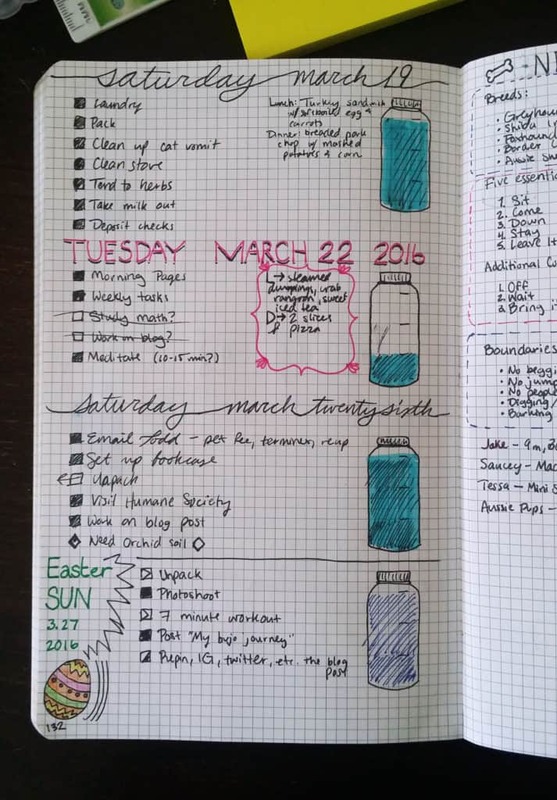 But I still struggled to use my bullet journal every day, so this still led to problems with forgetting tasks and deadlines. Enter BohoBerry. 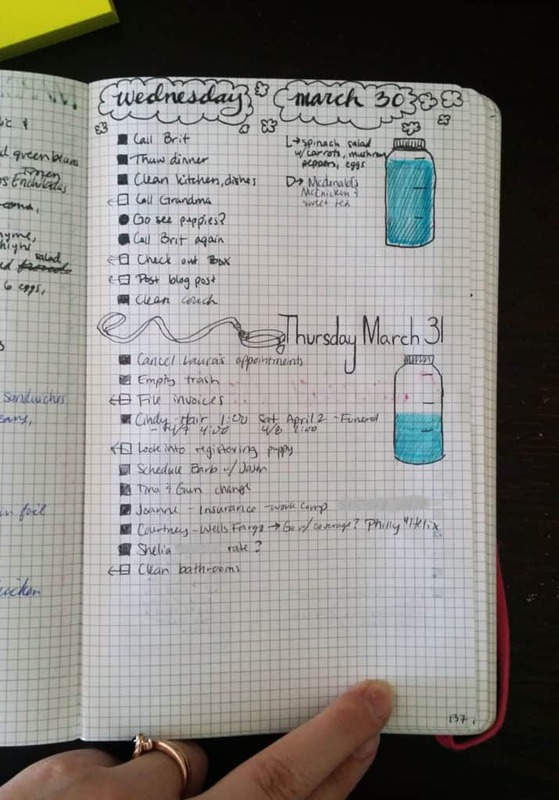 I discovered her in early February, and I went through a sort of bullet journal Renaissance. I added a few elements to my dailies, including a water tracker and a meal tracker in an effort to lose weight (which has worked so far!). I picked up cursive again for the first time in years and years, and I actually started having fun with my planning. I looked forward to setting up a new day and filling my bullets when I accomplished a goal. It felt like I was doing more with my days, and it felt good. This was when I kicked my monthly spreads in overdrive, but that’s another post. 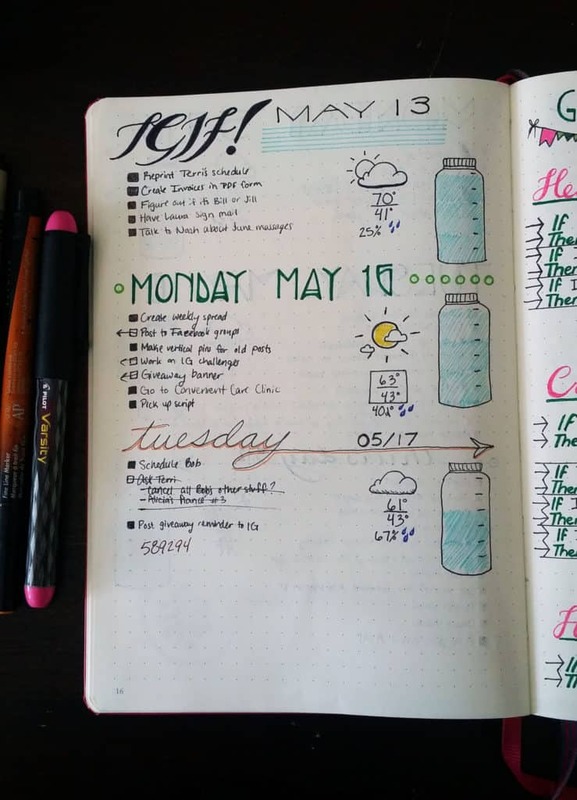 I started adding color more liberally to my spreads, particularly in the form of my water tracker. I used Sharpie Highlighters for this, but I began using them for color in other places as well. I also broke out the Crayola colored pencils for little things here and there, like the Easter egg below. They weren’t very portable, though, so I stopped using them pretty quickly. Thus began my lusting for colored pens/markers. I began using my bullet journal at my receptionist job, which made my dailies boom with information. I used it to take notes when I answered the phone, but I didn’t like the messy, cluttered look. 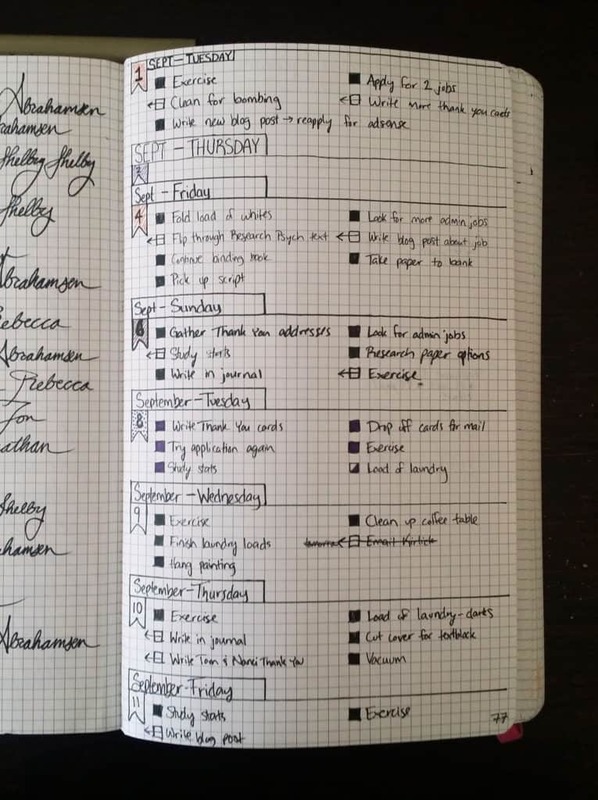 This is when I bought a set of colorful sticky notes to take down the rapid log stuff, which allowed me to keep my dailies cleaner and discard sensitive information like names and numbers for Instagram. You’ll also notice that I started allowing myself to take up more space with my dailies, putting only two or three days on a single page. This breathing room makes me feel less anxious and more productive. Another addition that became a staple in my dailies is the weather forecast. When I started sitting down and getting my daily set up the night before, looking at the weather forecast just made sense. If you want to keep track of the weather in your journal, grab my limited edition weather icon stickers from my Etsy shop! They are transparent and super glossy, and they look amazing on the page. You’ll love them! This is around the time I splurged on myself and bought a Staedtler Triplus Fineliner set. My color use has exploded since then, and I use my Fineliners for color almost as much as I use my Microns for black. I simplified some things, like my water tracker (I removed the amount of water, since I can remember that) and played with the formatting of my weather forecast and meal tracker. I still haven’t found the perfect way to write my meal tracker, but I’m pretty comfortable with my weather at this point. But surely that will change soon enough! And at long last, I moved out of my Ecosystem into my Leuchtturm1917. The grid paper was perfectly fine and much preferable to lined paper, but the dot grid suits me so much better. I feel more free to play with formatting and headers. I also tried out the timeline that I’ve seen in so many other bullet journals. It hasn’t really been all that useful to me thus far, but it could be wildly helpful to someone else. I would suggest you give it a try if you want more time-specific planning to your day. I will probably try it a few more times before I abandon it completely. My dailies have changed dramatically over time, and I have really enjoyed the transition. Flipping through my old dailies has really reminded me that experimentation has been the only reason I’ve stayed with this planner for so long. I realized over time what was important to me, what was interesting, and what simply didn’t work. I had to deviate from the original plain daily spread because it was just too boring for me. In order to remain interested and convince myself to come back day after day, I had to spice it up with color, doodles, and extra stuff. If that doesn’t work for you, that’s ok! You can prefer the black lines and simple boxes over intricate headers if that is what keeps your productive engine purring, and don’t let anyone tell you that you are doing it wrong. My advice for setting up our dailies is to try something new all the time. Don’t grow stagnant on your headers, bullets, trackers, etc. You will surprise yourself with what makes you tick, and the trick is finding it. So allow yourself to play and use new tools, and your ideal daily page will slowly emerge. To see more tips on getting started, see my post 8 Tips After Two Years with the Bullet Journal! How do you set up your daily spread? Tell me in the comments below! I really love that you show your progress through this post. I have stopped and started with the bullet journal so many times because I start comparing my pages to others. I love how you show that you started so simple and have made them beautiful over time. The cold hard facts are that my life is in chaos right now and I need to get stuff out of my brain and onto paper (enter bullet journal) but I need to do something creative to keep my interest (gifted with enneagram 7-ness – enter wanting to learn doodling, lettering, and water color). Thanks for all the inspiration – practical and gorgeous! I’m glad you found this article helpful! I think it is important to make sure you make your bullet journal work for you. 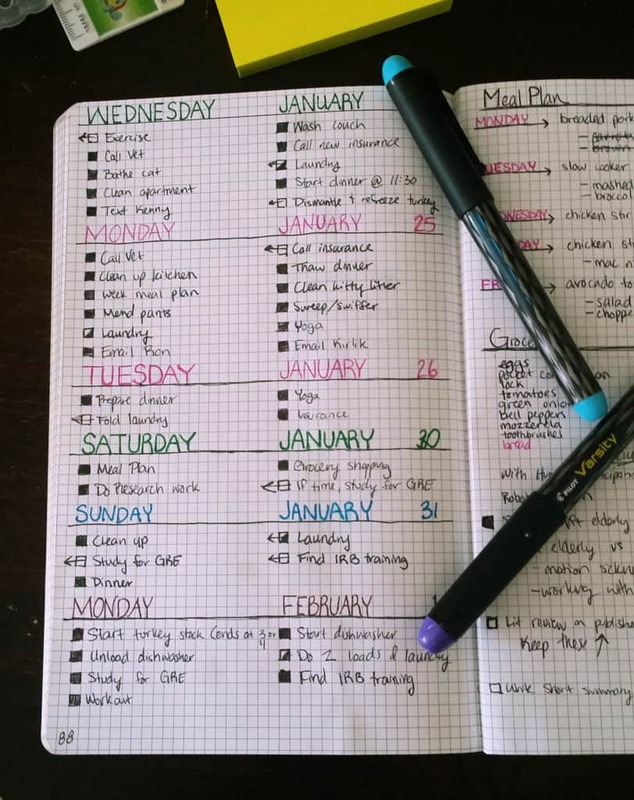 Too many people get focused on what is the “right way” to bullet journal, but the reality is that the right way is whatever you need that day. It may be that one day you need it to be minimalist, and other days you need it to be artsy! 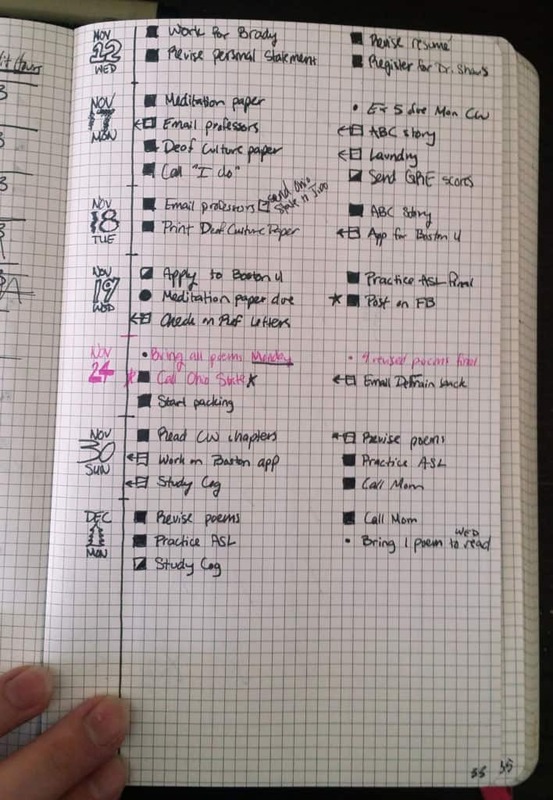 Interesting… I can find the same small square box by the side of your daily to do list which I do it in my daily spread.I too fill the box if I complete the task and of course half fill it if I complete it partially. I have started writing bullet journal from January 2017. This is the second month for me. Experimenting on it with my ideas. Your daily spread looks beautiful. You’re in the box camp with me, Mydhili! Some people use dots and cross them out, but I’m partial to these boxes. It’s far more satisfying for me to fill it in than cross it off my list. Thanks so much for coming by, and congrats on starting your bullet journal! Hi Shelby – Love your blog. Novice at Bullet Journaling but starting to get into it. 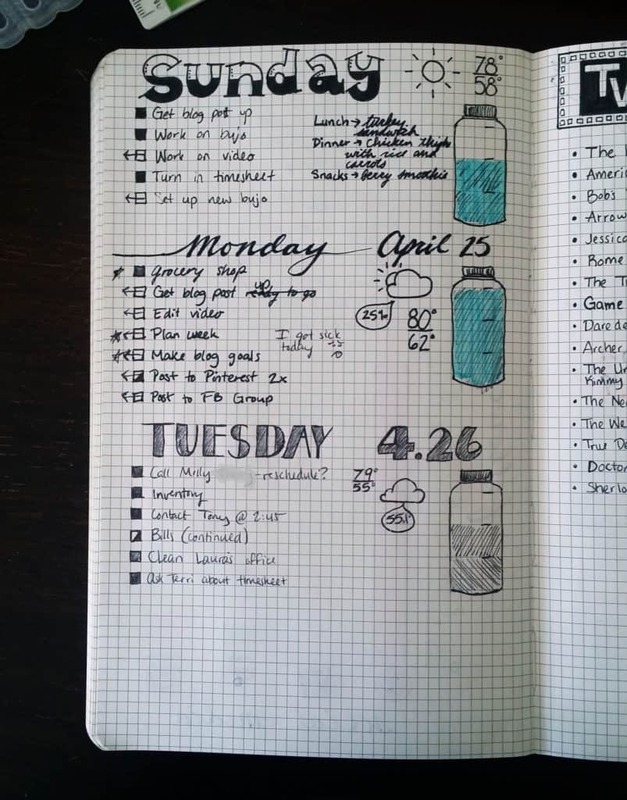 Had been doing something similar for work but am now trying to get it more cohesive with personal – tired of two many journals/planners on the plane! Although new at Bullet Journaling, long time user/collector/avid enthusiast for Fountain Pens! Inherited many from my mom and have added to the collection. Love the Pilot Varsity set – travel with them on airplanes and have never had an issue. Also love the Pilot Plume Italic – really reasonable and the Pilot cartridges last and last. I look forward to reading more of your posts and passing your blog on to my daughter who is now trying Bullet Journaling as well. 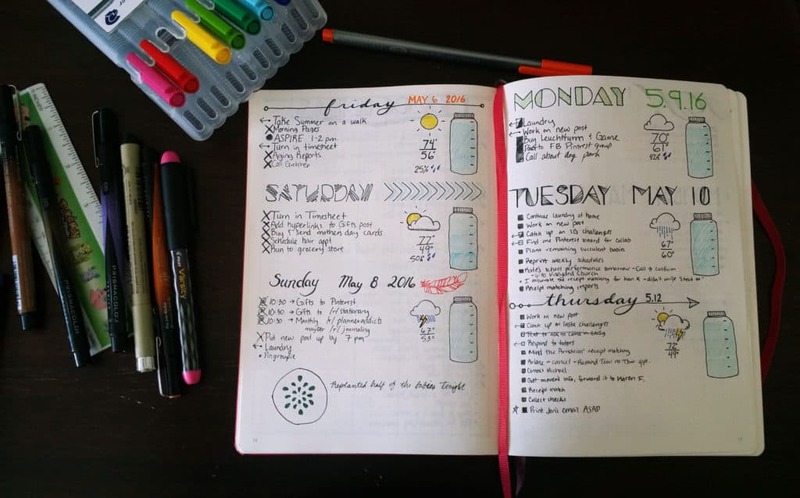 It’s lovely to meet you and have you in the fun world of bullet journaling! Fountain pens are fantastic, I’m super glad I’ve discovered this wonderful hobby. The Varsity set is what got me hooked 🙂 I appreciate your kind words and I hope to keep making posts that you enjoy! Hi Shelby. I really enjoy reading your blog. Your thoughts on bullet journaling are always interesting and inspirational. I love the clean look. You always have great photography. Which leads me to my reason for writing – besides just saying thanks! – for some reason, on this post about setting up daily entries the pictures won’t load for me. The only picture is the what I think of as your title collage. None of the individual pictures that go with your comments/explanations are showing up. Just wanted to let you know – I don’t have trouble with any of your other pages. Sarah, thanks so much for your kind words! And I have contacted tech support about fixing this issue, so thank you for letting me know about it. It’s always super helpful when lovely folks like you alert me to these bugs, so I super appreciate it. I hope you have a wonderful day! That is a great idea! I might have to give that a try. Thanks for that tidbit! I actually do US Fineliners, but only for headers as I don’t like them as much as my fountain pen. But you’re right; functionality is the most important thing, and mine is very functional! Oh, what kind of fountain pen do you use? I love using my Pilot Metorpolitan in my bullet journal, there’s nothing like how smooth it writes.